Mardi Gras is an institution in Louisiana. It’s a state holiday, a cherished tradition, and for some, a way of life that many plan for and look forward to year-round. 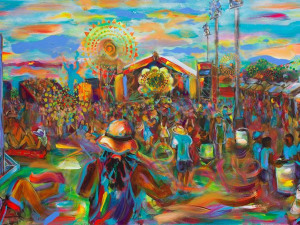 But Mardi Gras includes more than just the typical bead-catching, ladder-sitting, parade-going festivities that most people take part in during Carnival. Because as some 1.4 million revelers in New Orleans catch trinkets from floats, eat king cake and Popeye’s chicken, or attend masquerade balls on or just before Fat Tuesday, something entirely different is happening in rural Louisiana. 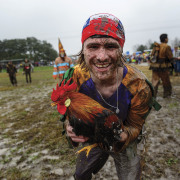 There—in towns like Eunice, Church Point, and Mamou—men (and, with few exceptions, only men) don colorful homemade costumes that bridge the gap between creative and creepy, ride around on horses begging for gumbo ingredients, and run through a field chasing chickens. This is Cajun Mardi Gras, and it’s about as far off Bourbon Street and Saint Charles Avenue as you can get. 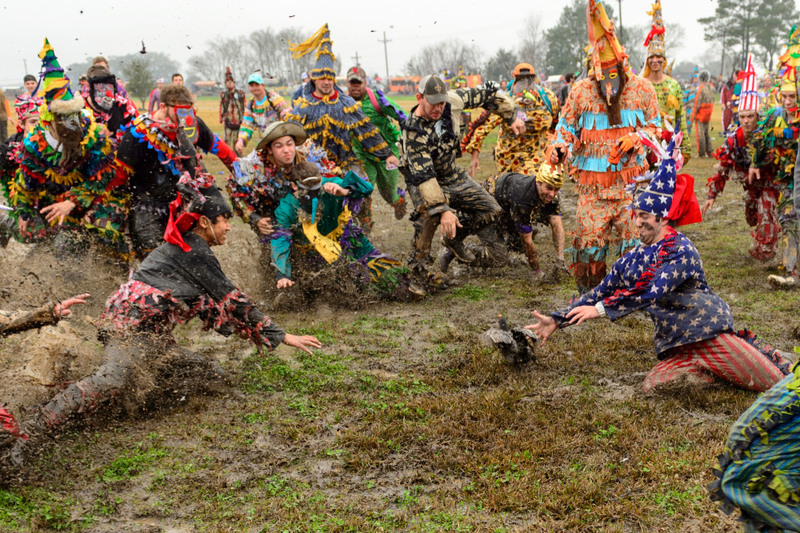 The Courir de Mardi Gras, which is Cajun French for “Mardi Gras Run,” originated in 15th-century France. Along with mad accordion skills and a few good jambalaya recipes, the Courir is just one of many things that the Cajuns’ French ancestors brought with them from the Old World. It all began in the 1400s and 1500s in France, which was under a feudal system at the time. The rich French nobles used to tax the heck out of the poor peasants who worked the land just to survive, as rich nobles so often do—anything for the wealthy French to make a few extra bucks at the expense of the poor, so that they could put a little extra brie on their baguettes or cream in their cafés au lait. If the peasants wanted to make wine to sell, the kings and lords taxed the grapes. When the peasants used only the skins of the grapes instead, to make cognac, the nobles taxed those, too. Then they said, “Let them eat cake!” and probably taxed the frosting. Yes, the saying goes that there are only two sure things in life: death and taxes. But those peasants from the days of French yore knew what to do. They dealt with the certainty of death by living life to the fullest, and the burden of taxes they handled with laughter and mockery. One day a year, on Mardi Gras, the men dressed up in costumes to poke fun at all the tax-hungry aristocrats. Then, these costumed men rode around from farmhouse to farmhouse, begging for their dinner. In exchange for a little song or dance, the farmers gave them everything from wine to chickens. Each family who donated to the cause was invited to a big dinner party held later in the center of town—an ancient rendition of today’s Cajun fais do-do. Everyone sang and danced and ate and partied with all the food and wine they had collected throughout the day. The tax collectors showed up to try to make a little collection of their own, but they only came up empty-handed: It was illegal to assess taxes on anything that was given for free, as all these goodies were. This tradition came to be known as the Courir de Mardi Gras. The French peasants passed down their fun-loving attitude and tendency for parody and mockery to their Cajun descendants. Just like in the olden days, participants today “make fun of everything—of everything that’s popular in society, or just make fun of society. But the true thing is to make fun of life itself,” says Todd Richard of Church Point, Louisiana. Richard was the co-capitaine of the Church Point Mardi Gras for over 10 years and is the current chairman of the annual Kids’ Courir de Mardi Gras there. He is also related to Elton Richard, who, in 1960, started the Church Point Courir as it we know it today. 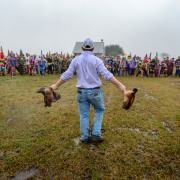 Held the Sunday before Mardi Gras Day, the Church Point celebration draws around 20,000 to 30,000 spectators every year, from as far away as France and Japan, who crowd into the tiny rural town of only 5,000 inhabitants to eat gumbo and watch the many festivities. The head honcho of the Courir is the capitaine, followed in rank by the co-capitaines. The rest of the runners—who share the name of the holiday itself and are simply called Mardi Gras—follow the capitaine, who maps out the eight- or nine-mile route and leads the pack. He must ask for permission to venture onto private property, and everyone runs around from house to house (and many ride on horseback), begging for handouts from the property owners. 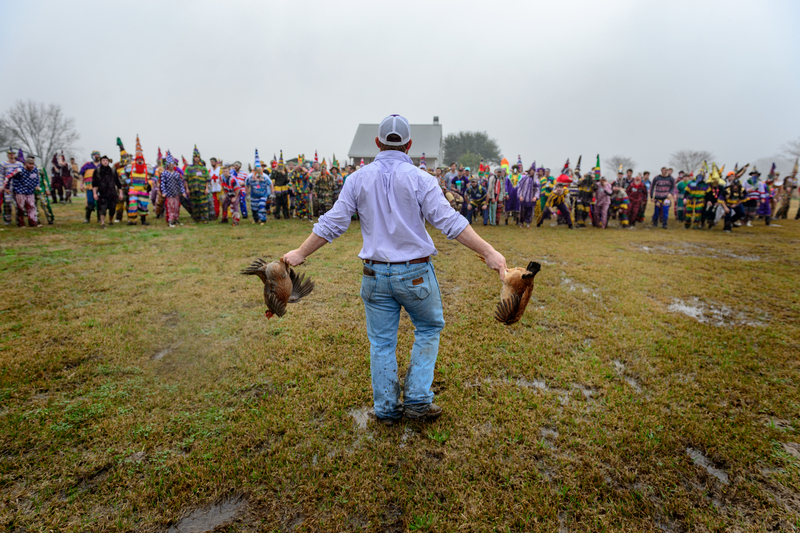 The most coveted offering is a chicken—destined, in theory, for a community gumbo that they will all feast on later. The gratis chickens are set loose for the “Mardi Gras” to chase after, which is half the fun (drinking the beer is the other half). He who catches the most chickens wins a trophy—meaning that they have no choice but to count their chickens. The runners sing and dance for their benefactors in thanks for receiving a chicken. And when they’re not begging for free stuff, they’re begging the ladies—who are not allowed to run, but watch from the safety of front porches—to dance with them. 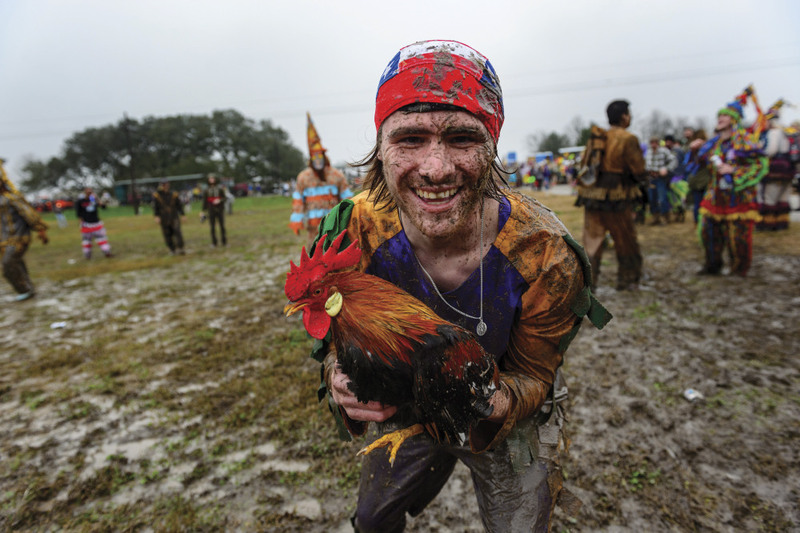 The Mardi Gras go to great lengths to catch a chicken. “If that chicken runs on top of somebody’s house, they’re gonna run on top of that house to catch the chicken,” Richard explains. “They’ll go across 30 acres and catch it. If it goes up a tree, they’re gonna climb that tree and catch that chicken. They’re not gonna stop until that chicken is caught.” In such cases, it’s probably fairly obvious why the chicken crossed the road. Yet contrary to popular belief and the uneasiness of animal rights activists, Church Point chickens don’t have it nearly as bad as you might think. No chicken was harmed in the making of this Mardi Gras celebration. Though the Courir runners and riders chase probably hundreds of chickens, they don’t kill them. They catch them and stick them back in cages on the so-called chicken truck, and someone comes and buys them—alive and clucking—the next day. These chickens really do come home to roost. 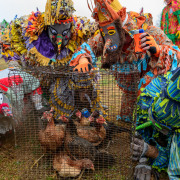 The time-honored tradition is to catch chickens to cook in a gumbo for all the revelers to eat, but that’s easier said than done. Although there’s a chicken in every pot, it’s not one that’s been freshly caught and killed. That simply wouldn’t be practical. “It takes too long to bring all the chickens back, kill the chickens, clean them, and put them in for the gumbo. It’d be like 9:00 at night before they would be able to eat,” Richard says. Therefore, while everyone is busy chasing chickens, the gumbo is already cooking—made with other chickens that met a much earlier demise. This means that Mardi Gras chickens are really the lucky ones. They may be exhausted and stressed from running around all day like, well, chickens with their heads cut off—but they will, in fact, escape that very fate. As a matter of fact, pursuing poultry might be rougher on the chaser than the chicken, and it’s not for the chickenhearted. “You’re gonna get bumped into, run into. You might get elbowed by accident,” Richard explains. Between 600 and 800 men take part in the Church Point Courir, and they all push and shove to catch a chicken at all costs. “Do you want to get in that lineup to go chase a chicken? If you have the boulons to do it, go ahead,” Richard says. But it’s dangerous, and no one would blame you if you simply chickened out. “Unlike in Eunice, we’ve never had anyone killed in Church Point. We’ve had some injuries: people falling off a horse, being kicked by horses; somebody might have been chasing a chicken on the roof and fallen off the roof,” Richard says. Or, there was the time that 15 men chased a chicken up a tree and got shocked by some nearby electrical wires. But even that couldn’t stop them. “People poured beer on their faces, and they got up and started chasing after the chicken [again],” Richard recalls. The iconic costumes of Cajun Mardi Gras are yet another important aspect of the overall experience. Bright and colorful with plenty of fringe and patchwork, the homemade costumes look a little like they were pieced together with glue and whatever scraps were kicking around on the sewing room floor, but that’s kind of the look they’re going for. They also wear masks crafted out of everything from cloth to old window screens with buttons and other such implements glued on. Sometimes, people get creative with their attire. “One of the best costumes I ever saw: He had white thermal underwear—pants and shirt—and every square inch, he glued a Cheerio. He called himself the cereal killer,” Richard says. 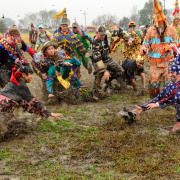 One such tradition in Church Point is the Kids’ Courir de Mardi Gras, which takes place the Saturday before Mardi Gras and the day before the big boys’ run. It’s open to children up to age 14, because at 15, they graduate to the adult Courir. Around 300 youngins take part, dressing up in costumes and chasing chickens. It works exactly the same as for the grown-up hen hunters, except that no alcohol is allowed and all the kids are on foot—no horses. The youngest children, up to age four, start off the day. They first pet the chickens so they’re not afraid of them, then run around after the birds for hours. Next, the bigger children have a go at it. If fear of missing your favorite New Orleans parade full of bead-flinging floats has you tempted to limit yourself to only urban Mardi Gras splendor, don’t. Church Point has its own parade as well. Anywhere from 40 to 50 homemade floats follow behind the runners and riders on horseback, parading through downtown after the run and chucking throws. Unlike the Courir, however, the parade is a fully public event, and anyone, even women, can ride. 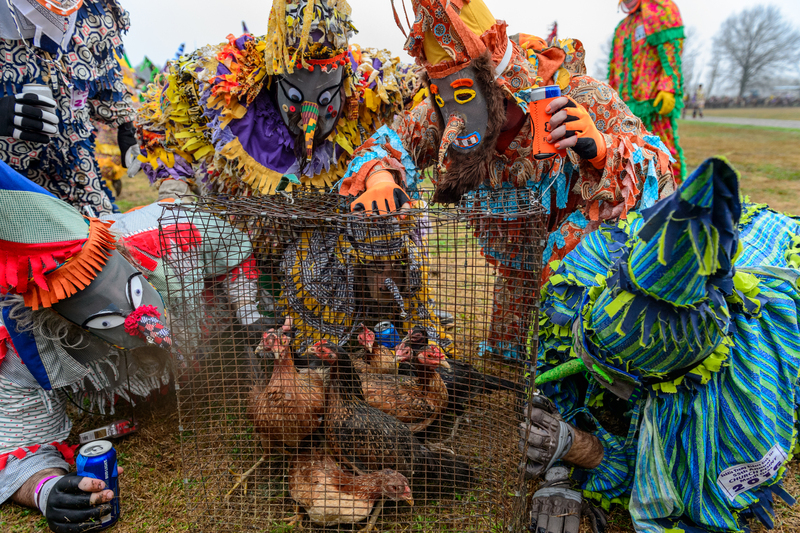 Filled with costumes and culture, gumbo and good times, Cajun Mardi Gras is a way for people to come together, indulge, maybe catch a chicken or two, and have one last hurrah before the sacrifices of Lent. 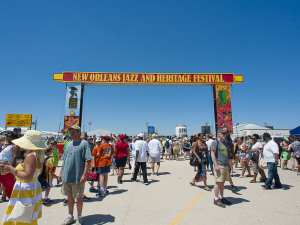 “It’s what Mardi Gras is supposed to be at its core,” says Carrier. “It is supposed to be an escape from ordinary life, filled with dancing, music, alcohol, and food. You sing and dance. You give your spirit freedom to run wild.” It’s a unique experience that you can’t find anywhere else in the world. Photos: Copyright by The Daily Advertiser/Scott Clause. All rights reserved. Reprinted with permission.